Note: This self-catered chalet is only available for whole chalet bookings taking the entire property. Booking individual rooms is not possible. Chalet Sylvie is a self-catered chalet apartment that is conveniently situated for both the skiing and the resort centre. It is just 400 metres (approx.) from the shops and nightlife and 375 metres (approx.) 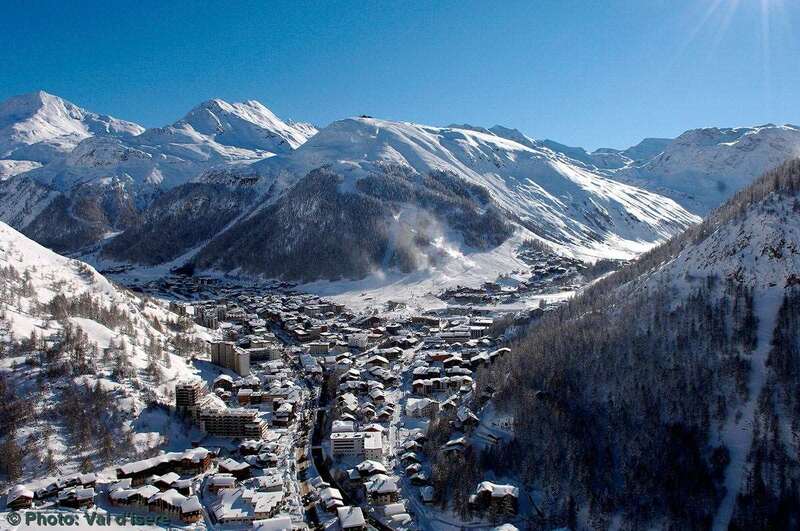 from the Savonettes Lift, from where it is a gentle ski to the Solaise and Bellevarde Lifts and the nursery slopes. In normal snow conditions it is possible to put skis on approximately 100 metres from the chalet and pole across to the nearest lift. This self-catered chalet apartment was refurbished for the 2016/17 season with a new open-plan living and dining area, plus all but one bedrooms were made en suite and now all feature beds that can be made into twins or king-sized doubles. Built with traditional stone and wood finishes, the chalet has a modern alpine style with a homely feel. After a long day on the slopes of Val d’Isere you’re welcomed by heated boot dryers and a lovely open-plan living and dining area, with its fireplace and floor to ceiling windows looking out towards the Face de Bellevard. It is the perfect place to relax in comfort and luxury. The extra single bed in room 3 allows space for up to 9 guests and offers children aged 2-11 years half price places, making it a superb option for families and small groups alike. This is a chalet apartment with all the right attributes; and after a renovating breath of fresh air, all the style too. Chalet Sylvie is a relatively small cosy apartment at one end of Val D'Isere. The walk into town takes about 10 minutes and isn't too bad however you can traverse along the slope once you have your gear to save time in the morning. Likewise you can ski really close to the chalet at the end of the day. We stayed in the triple room, which was nice - the third bed on the mezzanine level is quite a nice little room. There is ample place to store skis/boards downstairs however we kept our boots in the entrance area to the chalet. The chalet is perhaps slightly on the basic side however is very cosy and charming especially when the fire got going.